European Space Agency (ESA) officials are taking steps to shift into high gear the building of the ExoMars robotic rover mission. The lander would be launched in 2011, likely onboard a Soyuz Fregat 2b booster from the Kourou spaceport in French Guiana. On arrival at Mars, ExoMars would be equipped to scout about for the leftover traces of long-gone life or still thriving biology on the far-away world. Furthermore, the ESA robot is to help identify potential peril for a future humans-to-Mars mission - now resident on NASA planning charts as the year 2030. A detailed proposal to proceed with ExoMars is being readied for consideration by ESA member states at the agency's Council Meeting at Ministerial Level in December. 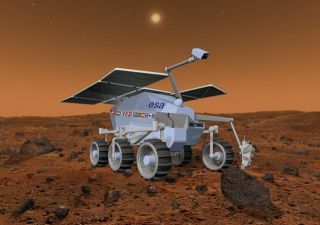 "An ExoMars goal is to look for signatures of extinct or extant life," said Gerhard Kminek, ESA Planetary Protection Officer within the Exploration Program, based at the European Space and Technology Center (ESTEC) in the Netherlands. A request for approval and funding for the entire mission will be made at the Ministerial meeting there, he said. Kminek was here to take part in the Biennial Meeting of the NASA Astrobiology Institute, held April 10-14 and hosted by the University of Colorado, Boulder. A decision has been made to land ExoMars without use of a Mars-circling orbiter that would set free the vehicle to spot-land on the planet. NASA's telecommunications infrastructure around Mars would be utilized for the ESA mission. These cost-saving approaches lower the mission price tag - putting it within the range of a $500 million to $600 million project, Kminek told SPACE.com. Earlier this month, two key meetings of space engineers, scientists, ESA strategists, and other interested parties crystallized on ExoMars, following some two-and-a-half years of study, Kminek said. The go-ahead involves the integration of some goals from two Mars concepts that were also under review: France's Netlander mission and a United Kingdom-proposed Beagle II, a look-alike of the failed craft that was lost to Mars in 2003. ExoMars will be outfitted with the Pasteur payload -- a wide-ranging suite of international instruments, including U.S. experiments, designed to characterize the martian biological environment. Kminek said ExoMars would feature improved mobility over that of NASA's dual rovers -- Spirit and Opportunity -- still at work on Mars for well over a year now. An additional asset on ExoMars and not on the twin rovers, nor the projected NASA Mars Science Laboratory, would be a drill to dig deep. The Mars drill would be able to bore into topside terrain to some 8 feet (2.5 meters) in depth, Kminek noted. "This is always considered as essential," he added. The ExoMars mission would be timed to work toward a future Mars sample return effort, Kminek said, a project that NASA is now eyeing for launch in 2016. "ExoMars can probably serve as a technology demonstration for some of the capabilities we want to contribute from the ESA side to a NASA-led Mars sample return mission," he added. One option is building a second ExoMars-like "fetch" rover, Kminek said, one that might be simpler, but devoted to collecting and stashing specimens for an arriving NASA-supplied return sample craft. A NASA-ESA joint working group on the sample return mission is to be initiated before this summer, Kminek explained. NASA appears willing to involve Europe in ways that are mission critical, and not in the manner that's a replay of Europe's involvement in the International Space Station. For the Mars return sample mission, "it should be a partnership amongst equals," Kminek emphasized. Doing so stabilizes the whole project, "on both sides of the Atlantic." Bringing back the goods from Mars direct to Earth has long been under study by John Rummel, NASA's Planetary Protection Officer, based at NASA Headquarters in Washington, D.C.
"In the development of the sample receiving protocols for a Mars sample return mission, we have worked extensively with the French space agency and other international partners already," Rummel told SPACE.com. "We would envision that any Mars sample return mission, by its very nature, would have the consent of a wide spectrum of international partners before we would bring it back and, hopefully, their active cooperation," Rummel said. Thanks to the Spirit and Opportunity robots, Rummel added, there's a much better understanding of what type samples can be shot back to Earth for detailed study. "We now have a much tighter consideration for the sort of sites and broader spectrum of materials that we're likely to run into," he said. But how many robotic sample missions are needed prior to green-lighting the first footfall on Mars? Before sending people to Mars, NASA-sponsored study teams have been busy identifying biohazard risk, atmospheric risk, radiation risk, dust and surface material risk, terrain/trafficability risk, transit issues, entry, descent and landing questions, concerns about surface operations, and science planning issues. "If you talk about using sample return missions, in general, to understand the planet better...then of course one is not enough," Kminek said. On the other side of pure science is the knowledge needed to ensure the safety of an expedition from crew-crippling problems on Mars, he said. There are some hazards on Mars that you can't identify and characterize with on-the-spot measurements. Samples are necessary, Kminek stated. While science is also needed to identify dangers to human crews, the line between pure science and research required to permit safe passage to Mars of humans isn't clear at the moment, he said. "This is not cast in stone...these things still have to be discussed," Kminek said. "On our side, I think we see this sample return mission as more of a precursor mission for later human exploration of Mars. You would be demonstrating that you can launch something from another world...since Apollo," he said. Kminek underscored the recent boost to ESA from its highly-successful landing of the Huygens probe on Titan, a moon of Saturn. "Everybody recognized that we did a good job. The cooperation was done well between NASA and ESA on the Cassini-Huygens mission," he said. Likewise, ESA's Mars Express orbiter is providing beautiful and extremely useful data, Kminek said. The role of international cooperation in a big Mars exploration adventure seems reasonable to consider. "When you go from sample return to a human mission to Mars...there's also need for more public support. And you want to have real firm cooperation between the agencies and the countries. The Mars sample return mission could be a good testbed for that," Kminek concluded.